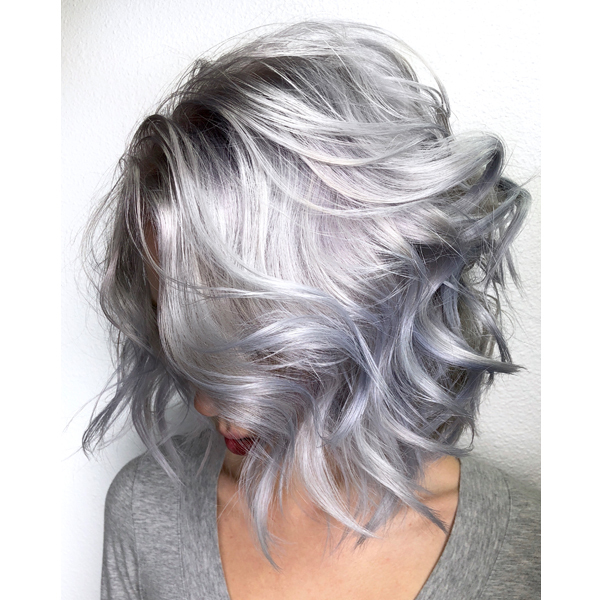 Achieving that perfect shade of silver is no easy feat, but Michael and Melody Lowenstein (@rossmichaelssalon), the pair behind Ross Michael’s Salon in Bremerton, Wash., mastered it and it got more than 19k likes on our Instagram! Find out how the #ONESHOT winners did it below. 1. Prelighten the hair by applying Formula A on the roots and Formula B on the midlengths. Then, process until she reaches a Level 10. 2. Working on wet/damp hair, apply Formula C to the roots first. Then, pull the formula all the way through to the ends until complete saturation is achieved. Process for 20 minutes. 3. Rinse thoroughly, then condition by applying Olaplex No.2. Process for 15 minutes. 4. Rinse again, blow-dry, then style as desired.